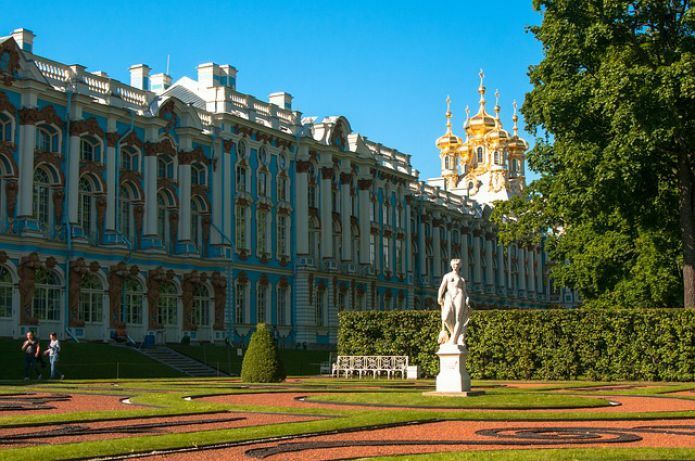 Tsarskoe Selo is one of the most beautiful places in St. Petersburg. From 1609 to 1702 on the site of the future Tsarskoe Selo, there was a manor house of the Swedish tycoon - Sara Manor. What in translation into Russian meant sar - a sailor, a manor - a manor, that is, a seaman's estate. After the expulsion of the Swedes, in 1710 Tsar Peter gave Sara's manor to Marta Skavronska, his future wife, known to everyone in the future under the name of Catherine Alekseevna. This date later became the date of the founding of the city. Later a small two-storey stone palace and auxiliary buildings were built, the garden was also expanded and ponds were excavated. After the construction of the wooden Assumption Church, the Sarskaya manor becomes Sarsky Selo. Under Catherine II, since 1780 the city became known as Tsarskoe Selo, a name that existed until 1917. After the revolution, the name was changed to the Children's Village named after Uritsky, which lasted until 1937. Since 1937 the city has become known as Pushkin. In 2008, the city of Pushkin becomes one of the districts of the city of St. Petersburg (Pushkin). The former imperial palace is one of the largest in the suburbs of St. Petersburg. It was established as a summer residence in 1717 by the order of Empress Catherine I. In 1743, Empress Elizaveta Petrovna ordered to expand and beautify the palace due to which the latter acquires its own look and style. 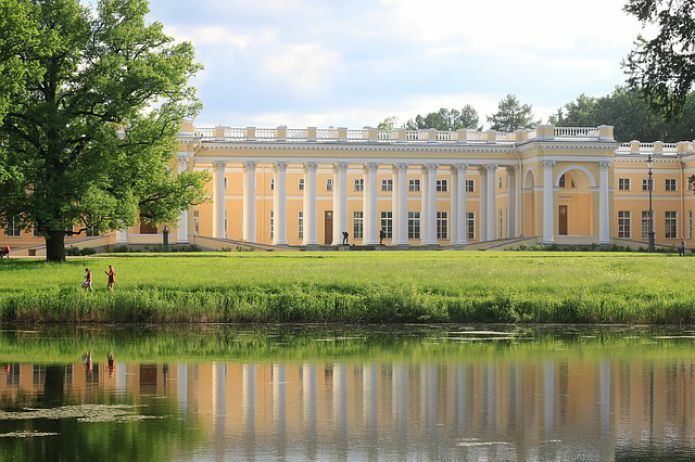 But in 1752 Elizaveta Petrovna decided not to stop at the achieved and starts a complete reconstruction of the palace, because it considers it small and old-fashioned. Reconstruction is carried out under the direction of B.F. Rastrelli lasted four years and was successfully completed. 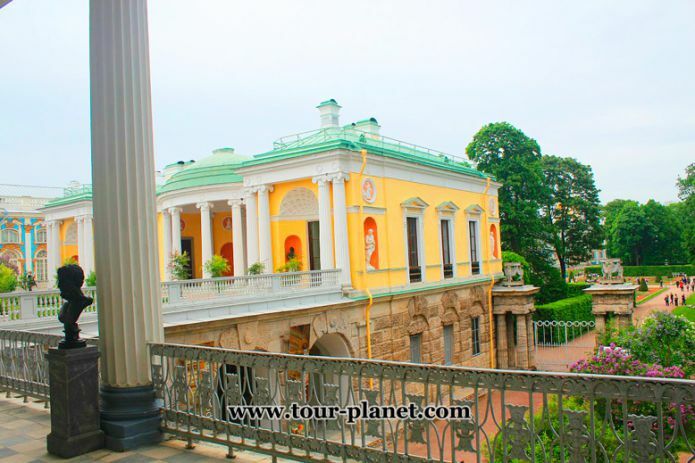 The palace has a length of 325 meters and is designed in the style of the Russian Baroque. In 1756 the palace was presented to the Empress and foreign guests. During the German occupation, the palace suffered very much, very much was burnt or was looted. Works on the restoration of the palace were conducted for a long time, in our time the whole ensemble is in a restored state. The material used in the furnish is predominantly amber. The cabinet was created for the Prussian King Frederick I by German masters. Later, in 1717, he was presented by the son of Friedrich, Friedrich Wilhelm I to the Russian Tsar Peter. In 1743, by order of Empress Elizabeth Petrovna, the office was changed and finalized under the guidance of architect FB Rastrelli. Until 1755 the cabinet was located in the Winter Palace of St. Petersburg. Later, Elizaveta Petrovna ordered to create a new Amber Room in the Tsarskoye Selo Palace, the office is dismantled and transported to Tsarskoe Selo. In the new place, the area reserved for the cabinet was much larger, and Rastrelli had to refine the interior. In the finish of the cabinet, gilded wooden carvings began to appear, mirrors and mosaic pictures of agate and jasper appeared. Acquiring even greater scope and luxury is no longer an amber cabinet, and the amber room becomes one of the most beautiful objects of Tsarskoe Selo. 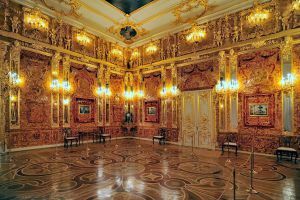 During World War II, the Germans kidnapped all the furniture of the Amber Room from Tsarskoe Selo, after which the room is exhibited in the museum of the Konigsberg Castle, the last place where the Amber Room was seen, its further fate remains unknown. To restore the Amber Room began in 1979. For 24 years of work, the masters were able to recreate the lost masterpiece. By the 300th anniversary of St. Petersburg, all the works were finished and the Amber Room was able to receive its first visitors. Official site - State Museum-Reserve "Tsarskoe Selo"
On Mondays: from 10:00 to 21:00; cash desks and entrance visitors until 20:00. Closed: Tuesday and last Monday of the month. 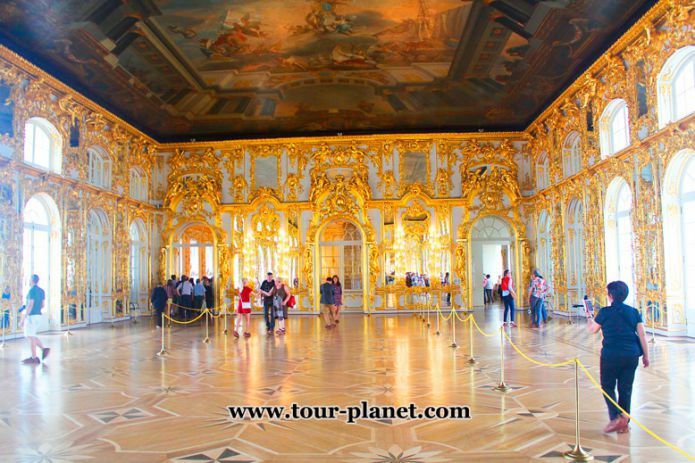 The route of the sightseeing tour of the Catherine Palace includes a visit to historical interiors, incl. The Golden Suite and the Amber Room. The entrance to the park is open from 7:00 to 21:00. The ticket office of the park is open from 9:00 to 18:00 daily, from April to October. The rest of the time the entrance to the park is free. Visitors having a Guest Card of St. Petersburg - admission free of charge during the validity period of the card ! Such a gift the Empress made to her grandson - Prince Alexander Pavlovich, in honor of his marriage. For the design and construction of the imperial court invited the famous Italian Giacomo Quarenghi. In the middle of June, 1796, the newlyweds settled in their new palace. At one time, the Emperor Nicholas I loved him. His grandson, Prince Alexander Alexandrovich (later - Emperor Alexander III), in this building also had their apartments located in the right half of the palace. Western - Raspberry room or Billiard room. There was a Concert Hall in the palace - in the left wing, as well as an Angular living room, connected with the palace church and the library. The magnificent palace in the beginning of the 20th century became the main one in the Tsarskoye Selo residence of Russian emperors. Nicholas II took in the palace of foreign ambassadors, there were celebrations in honor of the three hundredth anniversary of the Romanovs' house. The last Russian emperor rebuilt the Alexander Palace. Instead of the suites, he arranged the apartments for himself and his wife. The left ensemble of the palace was transformed, enriched with a beautiful Lilac cabinet, Rosewood lounge and Bedroom, and the right one - with the Workroom, the Dressing Room and the Dining Room. The Emperor also refused from the Concert Hall, designed by J. Quarenghi. In his place, according to the reconstruction project (author R. Melzer), the Empress's Maple Living Room and the Emperor's Ceremonial Office were created. And on the second floor of the left wing was equipped with a children's half. In Tsarskoe Selo, Nicholas II was born, he loved this suburb of St. Petersburg. After the revolution of 1905, the emperor and his family lived permanently in the Alexander Palace. Here the Romanovs spent the last 12 years of their lives, here the family was arrested on August 1, 1917. The semicircular hall became the last refuge for them. Hence the royal family was sent into exile in Yekaterinburg, where they were shot. In 1918, the State Museum was established in the Alexander Palace. 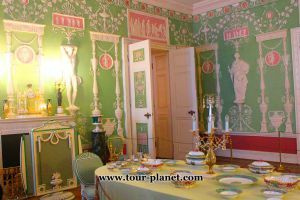 Here you can see the historical interiors and things of the Romanovs. And then, in part, the Tsar's apartments were given to the Rest House of NKVD workers and an orphanage. During the Great Patriotic War in the palace, the German invaders organized their headquarters, the Gestapo, in the cellars - the prison. In general, after 1917 the fate of the Alexander Palace was tragic, as well as the last representatives of the Romanov dynasty. In the postwar years, the premises of the palace were used as a repository for books (Institute of Russian Literature) and under the exposition of the Pushkin Museum. His new life Alexandrovsky Palace found in 2010. After a large-scale reconstruction for the visitors in the central part of the building, the Portrait, Marble and Semicircular Halls were opened. But in general, work on reviving the former greatness of this wonderful monument of architecture is still ongoing. Weekends: Tuesday and last Wednesday of each month. Visitors with the Guest Card of St. Petersburg - free of charge during the validity period of the card. In the Russian Empire, the Imperial Tsarskoye Selo Lyceum was a privileged higher educational institution for the children of the nobility. By order of Emperor Alexander I in 1810 the lyceum was founded, and in 1811 it was already open. The duration of study at the Lyceum was 6 years. Lyceum where the same training was planned for the younger brothers of Alexander I - Nicholas and Michael. The goal of the Lyceum's existence was the training of top government officials. 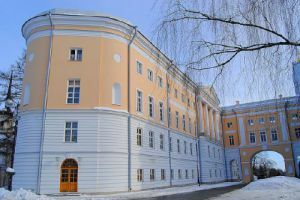 The educational institution itself was located in one of the palace wings of the Catherine Palace. The building was rebuilt in accordance with the needs of the establishment. In a building of 4 floors, each lyceum student had his own room. In 1843, the Lyceum was transferred to St. Petersburg and by the decree of Nicholas I was named the Imperial Alexander. Some of the most famous pupils of the Lyceum were Pushkin, Pushchin II, Kukhelbeker VK. Matyushkin F.F. Saltykov - Shchedrin ME and many other glorious sons of his Fatherland. Pushkin, st. Sadovaya, 2 phone (812) 476-64-11. Closed: Tuesday and last Friday of the month. From Vitebsk railway station, the trains run on schedule, the journey time is about 30 minutes. 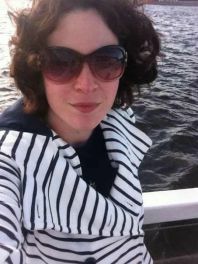 Also in the city of Pushkin, there are a lot of catering places with more democratic prices, below is not a complete list where you can have a bite. On the map, these places are marked with yellow markers.